1. I need immediate assistance. If you are in a life-threatening situation, you will need to contact emergency services. Emergency Medical Assistance: Please call for emergency services. In America, Mexico, and Canada, dial 9-1-1. Emergency Shelter: Not all shelter providers are safe and/or tolerant of non-cisgender bodies, expressions, or identities. In the US: Faith-Based shelters are legally allowed to discriminate against you if they claim such discrimination as part of their faith. Additionally, you need to be aware that our current US Attorney General is attempting to make it legal for all providers of housing to discriminate against you. Having said that, providers with HUD housing contracts signed before 2017 are currently barred from discriminating against you; however, you should be aware that the current US administration is working to overturn these protections. Housing providers who accept Violence Against Women Act (VAWA) monies are barred from discriminating against you. Since the VAWA is an act of US Congress, its nondiscrimination standards are federal law. 2. I need help from the Trans Disaster Relief Fund. Home/Primary Residence: We will provide some housing assistance to individuals and families who have lost their homes as a result of an officially declared disaster. If you are a renter or homeowner you may qualify for assistance. If your home was impacted by a major disaster we recommend that you apply for assistance. Other Needs Assistance: We offer disaster assistance for some of your other disaster-caused expenses including, medical, child care, funeral and burial, essential household items, moving and storage, vehicle, and some clean-up items. Apply for assistance through the Trans Disaster Relief Fund here. 3. I applied for assistance, what’s next? Please be aware that donations to the Trans Disaster Relief Fund are absolutely minuscule compared to practically all other funds raised for general disaster recovery efforts. Because the Fund is small, TFA must be judicious in its allocation. Needs-Based: Funds will be directed where needs are the greatest. Duplication of Services: Funds cannot be used to duplicate services accessible elsewhere to the community. Community-Helping-Community: TFA is a Houston-based volunteer organization and does not have staff; this means that everyone you interact with is also a community member, who survived the Hurrican Harvey disaster, and is volunteering their time in helping other community members recover. 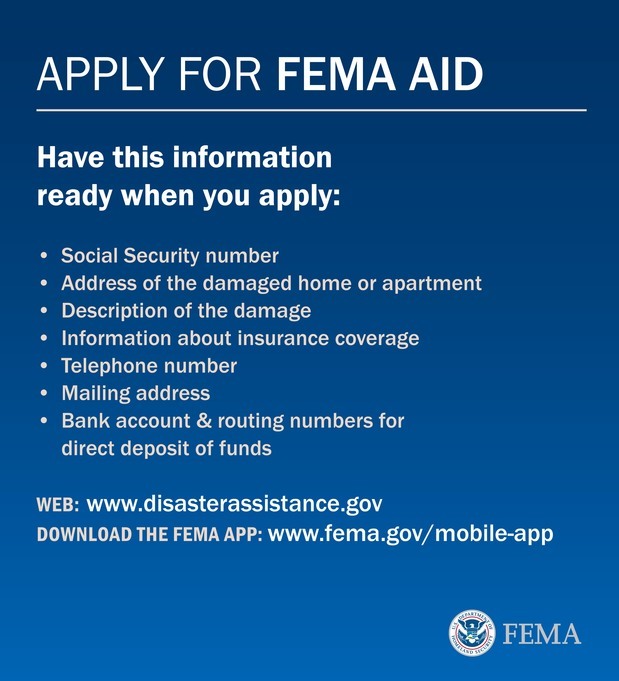 This graphic lists seven info items that applicants will need when applying for FEMA individual disaster assistance.